The Pledge of Allegiance, Take Me Out to the Ballgame, your Miranda Rights, the theme song to Laverne & Shirley, and the Lord’s Prayer. What do all of these have in common? Not much, except that they are perhaps the more commonly known and publicly recited written works of the past few generations. Ok, so maybe it’s just me with “Schlemeel, Schlemazel, Hafeen…” But I would guess that most of these have rolled off your tongue since long before you can remember. I point this out because of what struck me during a sermon that Pastor Beaty gave a few weeks ago. 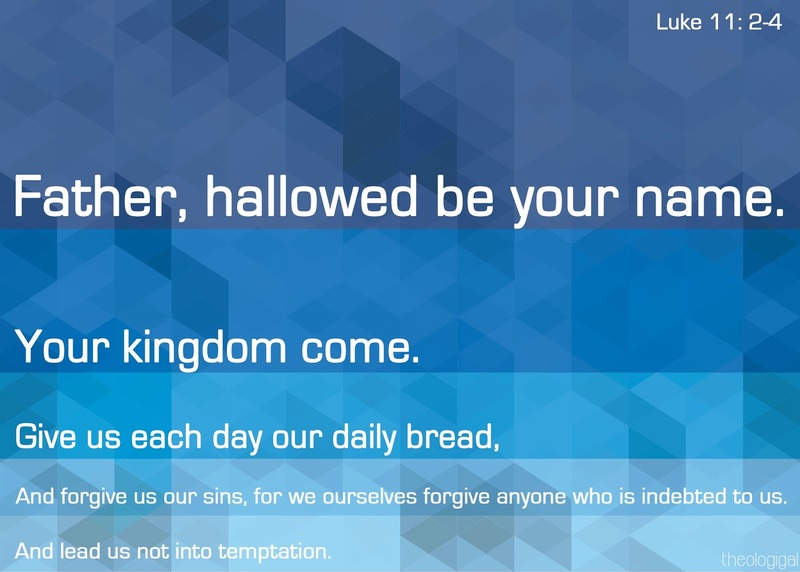 As part of his series on The Attributes of Disciples, he spoke to what we refer to as the Lord’s Prayer. In deconstructing these verses, Pastor Beaty emphasized the solid theology that is included in this short passage. I won’t cover all of his points, (though the online sermon is definitely worth a listen), but I would like to comment on the very first one. Luke 2:11 begins with: He said to them, "When you pray, say: "Father, hallowed be thy name …." Now, break it down from there: …. "Father, hallowed be thy name …." Once more:…. "Father, hallowed …." STOP right there. Just two simple, yet powerful words, placed back-to-back, we are provided with a teaching on God and His character. “Father” - The word here implies that we are praying as a child to a father. One who has adopted us and brings strong confidence to us, as our earthly fathers do. A tender and respectful love between the father and child. This is how He teaches us to come to Him, and to enjoy Him in this relationship. Then, as if saying, “But don’t forget that I am Holy,” He reminds us of how “hallowed” we are to keep His name. In other words, God’s name is holy, it is to be celebrated and esteemed with great reverence. He should be held high in a place of honor and worshipped like no other. Did you catch that? On one hand, God is a relational God, eager to engage in conversation as a father and child might. On the other hand, God is a holy God, expecting that we remember who He is and of the glory that he deserves. These characteristics are not in conflict. They do not counter one another in a way that prevents us from responding to Him in either way. He is most definitely both, and we are to approach Him as both. We have quoted this verse, or similar translations, since our childhood days. Perhaps our kids don’t recite it as often, but most of us recall pre-game football locker rooms (substitute basketball, baseball, soccer), the start to lunch-time FCA meetings, and maybe even PA announcement to begin school each morning. Can you even guess how many times we’ve said the Lord’s Prayer? Sadly, I for one, had little comprehension as to the meaning that those words represented, much less the recognition that God was offering such an awesome insight in the opening line! Good luck in those two marathons you've planned. Ha! How about God Save the Queen, Hey Jude and the official club song for Manchester United! Thanks ORF, love the reply and appreciate the wishes for the upcoming races. I will definitely need good thoughts for the more immediate one, and then hopefully rely on a well executed plan for the fall event. Take care. Have a great week.